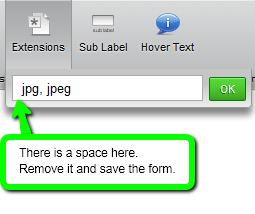 jpg file extension is not allowed. You can only upload jpg, jpeg files. Please go back and fix this. How? Does the list of allowed types have to be written differently? What form is happening on? We can take a look and see what, if anything you are doing wrong. The extensions are listed correctly. So that's not the cause. We'll issue a ticket to our Tier 2 team and see if we can get this resolved for you.